1. The Second Asian-Pacific City Summit was held in Guangzhou from September 28 to September 30, 1996. Leaders from 20 cities of 11 countries and regions in the Asian-Pacific Rim as well as specially-invited United Nations' representatives devoted to animated and fruitful discussions focusing on the theme Urban Development in the 2lst Century. 2. This Summit indicates the common wishes of the cities in the Asian-Pacific region to continuously promote exchanges and cooperation. With the joint efforts of all participants, mutual understanding has deepened and friendship enhanced, reaching consensus on a number of issues. This has laid a solid foundation for further extending the friendly cooperation among cities in the Asian-Pacific Rim. 3. We are now marching toward the 2lst century. The strength of peace is increasing, economy is playing an increasingly important role and the trend of world diversity and regional cooperation is becoming more obvious than ever before. To maintain peace and seek development are the main stream today and also the common aspiration of the people in the world. One of the major issues confronting Asian-Pacific cities and requiring careful study is how to formulate and implement development strategies in the light of local conditions and with a view to the 2lst century so as to ensure sustained economic growth and all-round social progress. 4. Asian-Pacific region has made outstanding contributions to human civilization and progress. As the 2lst century is approaching, nowhere else in the world experiences more rapid growth and shows greater diversity than the vibrant Asian-Pacific region. The swift rise of the cities in this region plays a very important role in the regional prosperity and stability. It is believed that, when they grow beyond this century, these cities will play increasingly important role in this planet. 5. The Asian-Pacific cities striding toward the 2lst century are not only having golden opportunities for the development, but also facing various problems relating to environment, traffic, employment and public security. Leaders of these cities should have a clear insight of the current situation and undertake important tasks with a strong sense of historic mission to make due contributions to growth and prosperity in the 2lst century. 6. Cities in the Asian-Pacific region share both similarities and differences. They stay in different social and economic development phases due to historical background of their own. We should promote the exchanges and cooperation between these cities on the basis of attaining equality and mutual respect, seeking common ground while reserving differences and learning from each other's strong points to offset one's weaknesses in order to achieve the joint development in the 2lst century. 7. The expansion of the Asian-Pacific cities in the 2lst century will inevitably need sustained development. On the basis of their own situations, Asian-Pacific cities should make great efforts to seek a sustained development path, whereby the urban population, economy, society, environment and natural resources exploitation can develop in a harmonious way and meet the demand of the present generation while avoiding endangering of future generations. 8. A sound urban planning and development is an essential prerequisite of the development of the Asian-Pacific cities in the 2lst century. Science and unique features must be valued in the urban planning and construction, and consideration must be given not only to current needs but also to the development space for the future generations. 9. Environmental protection is an issue of common concern in the international community and an important part of Asian-Pacific urban development in the 2lst century. We will continue to enforce the international conventions on environmental protection and to undertake the obligations and responsibilities. We will further improve environmental protection laws and regulations, bring pollution under strict control, gradually awaken people to the importance of environmental protection and earnestly protect and improve urban ecological environment. 10. One of the major tasks confronting the Asian-Pacific cities in the 2lst century is how to handle the relationship between modernization and traditional culture. We shall place the modernization drive as the priority on the agenda of Asian- Pacific urban development in the 2lst century, and at the same time, attach great importance to protecting and carrying forward the excellent traditional culture. Integrating urban modernization with excellent traditional culture will add to the distinctive character and attraction of the Asian-Pacific cities. 11. The Summit wishes to broaden the fields of exchanges and cooperation for Asian-Pacific cities to seek mutual development and prosperity. The participating city leaders undertake to tap their resources to create necessary conditions for further strengthening the interchanges and cooperation among the Asian-Pacific cities. 12. The leaders of the Asian-Pacific cities will increase direct contacts and dialogues. In addition, we shall vigorously carry out the exchanges and cooperation in science, technology, culture, art and other fields to bring the friendly relations among the Asian-Pacific cities to a new level. 13. Economies of Asian-Pacific cities are particularly complementary to each other with increasing business transactions and cultural exchanges. The participating leaders hope that the Asian-Pacific cities will place economic cooperation as one top priority and important foundation on which to build friendly relations and cooperation in the 2lst century and beyond. 14. In order to develop the well-established friendly cooperation, the Summit proposes to continue convening the Asian-Pacific City Summit in the years ahead and sincerely welcomes the participation of more city leaders. 15. 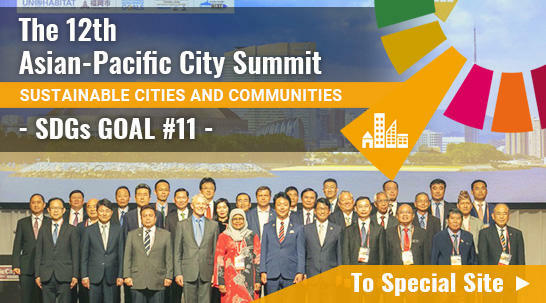 The participating city leaders believe that the consensus reached in this Summit will exert profound influence on the development of Asian-Pacific cities in the 2lst century and the achievements will go down in history of exchanges and cooperation among Asian-Pacific cities.